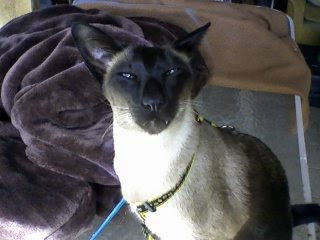 Last Friday we had a bit of a scare as our siamese cat "droelie" escaped from the garden whilst we weren't looking. I found him wandering the street two doors down. We were lucky to get him back as he is a real house cat and not used to exploring the neighbourhood. He showed us how he got out, basically by jumping on the roof of the shed, so we had to close off that escape route. 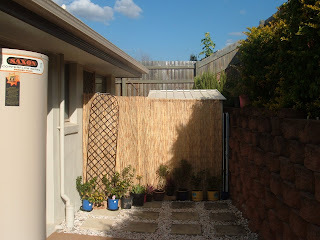 We erected a temporary fence made of a sheet of thin bamboo, only $20 at the local DIY shop. Now he's tasted freedom he is literally like a caged animal pacing up and down looking to see where else he can escape from. Hopefully he will soon forget his adventures and be happy with the house and garden again.